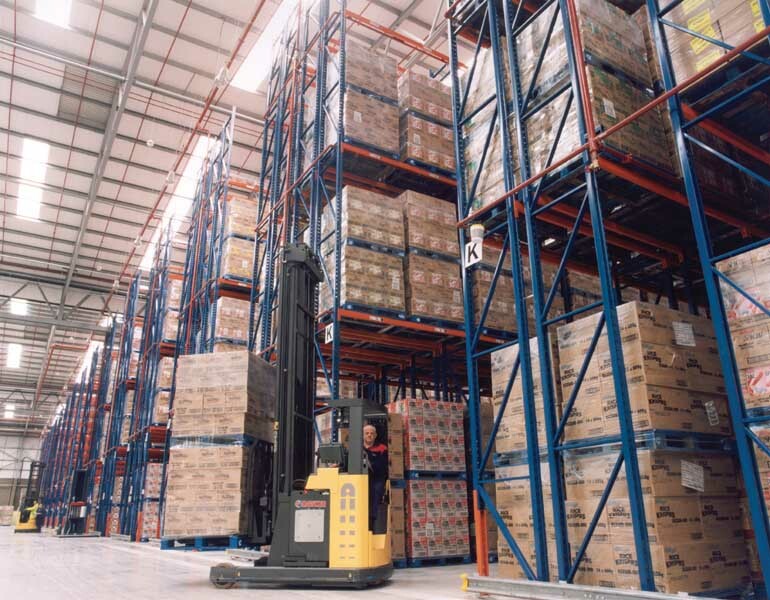 One of our biggest orders in 2003 was to supply racking for a new high bay warehouse and distribution facility to be used by the Kellogg Company, the world’s leading producer of cereal and a leading manufacturer of convenience foods such as cereal bars, frozen waffles, toaster pastries, cookies and crackers. The new 35,000 square metre distribution centre is located close to Kellogg’s existing Trafford Park manufacturing plant, the largest cereal factory in the world. 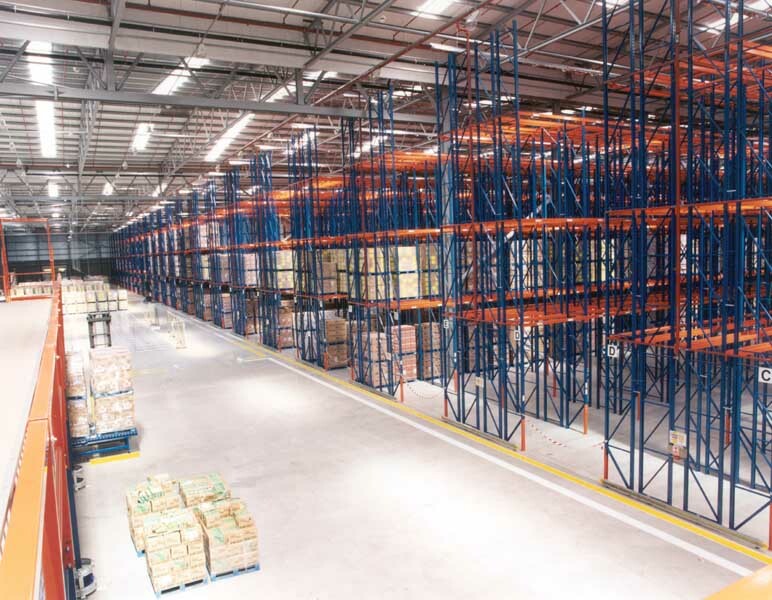 The new warehouse, christened KW1, was built as part of a plan to consolidate Kellogg’s warehousing and to establish a flexible, efficient and responsive distribution operation. 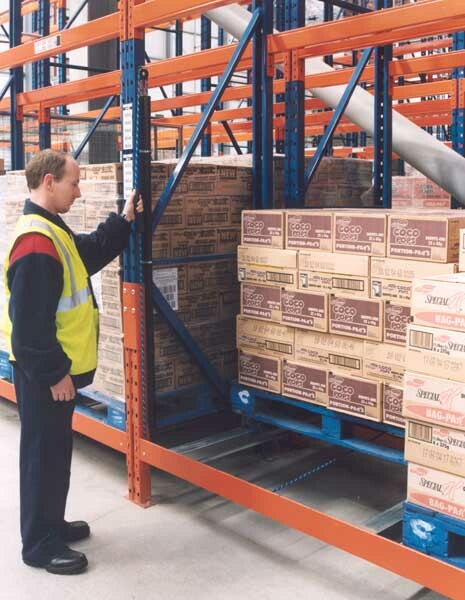 Kellogg’s two sites are operated by Exel, its sole supplier of external primary warehousing, on mainland UK, for ready to eat cereals delivered directly from the factory. KW1 is a fourteen-metre high building, set on a seventeen-acre site. It has twenty-two loading bays with dock levellers, two ground level bays and four automatic intake bays. 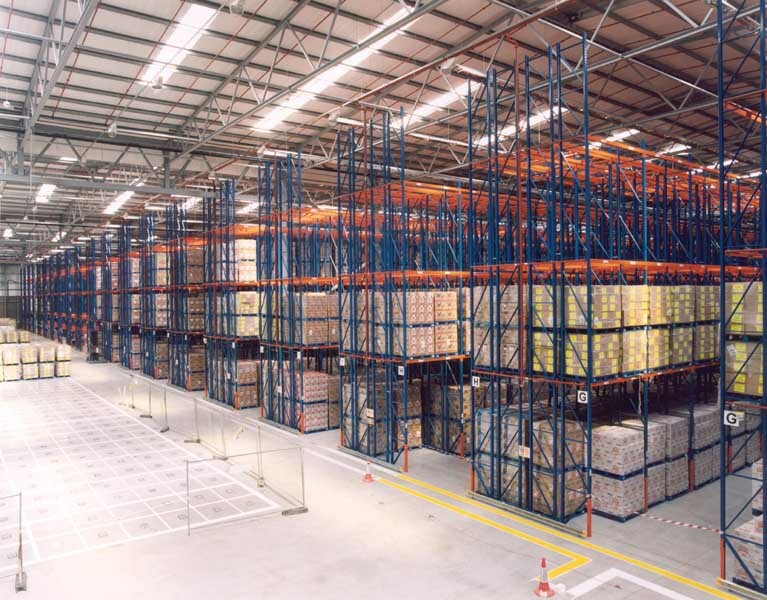 It can store up to 32,000 pallets and serves Kellogg’s customers throughout the UK and Ireland. KW1 operates twenty-four hours per day, seven days per week. 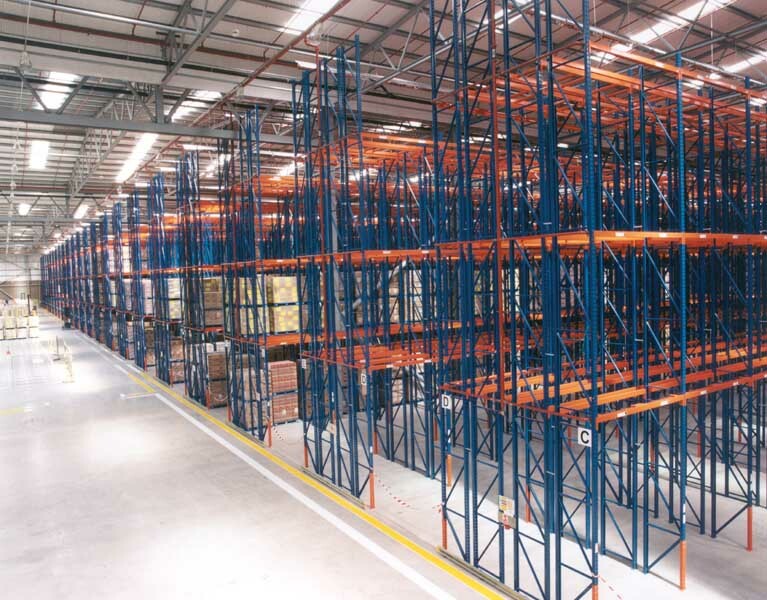 The double deep racking configuration allows one pallet to be placed behind another. 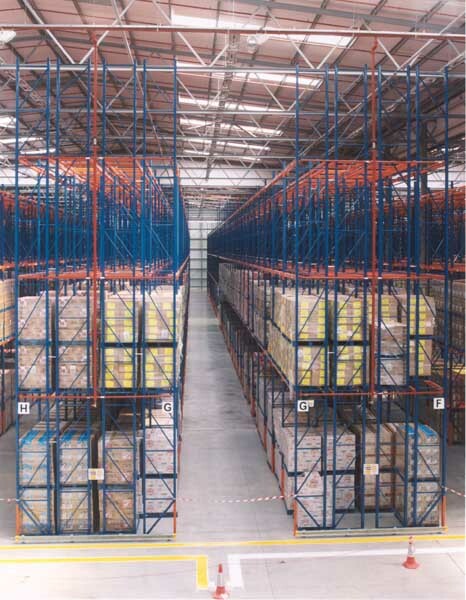 Twice as many pallets are stored for a given number of aisles with similar space utilization to Narrow Aisle. At Kellogg’s, the twenty-four double entry and two single entry racking runs stretch to nearly 120 metres in length. The warehouse stores full pallets, which either replenish a forward picking area or are despatched as complete units. Throughout the scheme, storage is on four levels, with the top beam at 10.8 metres. Sacrificial legs are fitted throughout and an automatic sprinkler system is built into the racking. An interesting feature of this installation is the layout of the picking bays. The ground level bays are fitted with horizontally mounted push back rails. Two pallets sit one behind the other. The rear pallet is pushed back when the front pallet is in position. The bays house case picked products. When the front pallet is removed the operator pulls on a pulley rope and the rear pallet glides forward to the front of the bay. “This give us significant safety and ergonomic benefits.” Adds Mark. The second level pick face consists of inclined push back bays for products shipped by the pallet. The rear pallet sits on a trolley mounted at a small gradient. It rolls gently forward, when the forklift truck has lifted the front pallet out. Three bays have been left empty to house a computer terminal, printer and scanning equipment. Once an order is complete, the operator comes to the closest printer station to create a despatch label for the load.